Hello and Welcome to our Colour INKspiration challenge! This is a fabulous blog hop of wonderfully talented designers ready to inspire you in new and different ways using Stampin' Up! Colours. Make sure you keep hopping all the way around! All entries will be via this Facebook group so make sure you add your creation there. It's been a very long time since I sat & stamped. Everytime I tried, things just got busy & I gave up. Today I thought I would join the the Colour INKspiration blog hop & literally made myself sit down & stamp. I started with a card sketch & worked on 2 cards to add to this weeks hop. When it's been a while I find it easier to create from a sketch or CASE the catalogue. Today it was just SO hard to even get started! 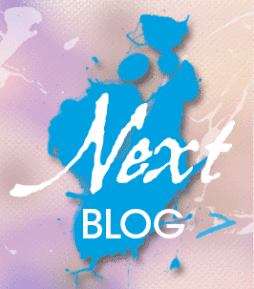 Here is the gorgeous colour swatch we are working with this time around. 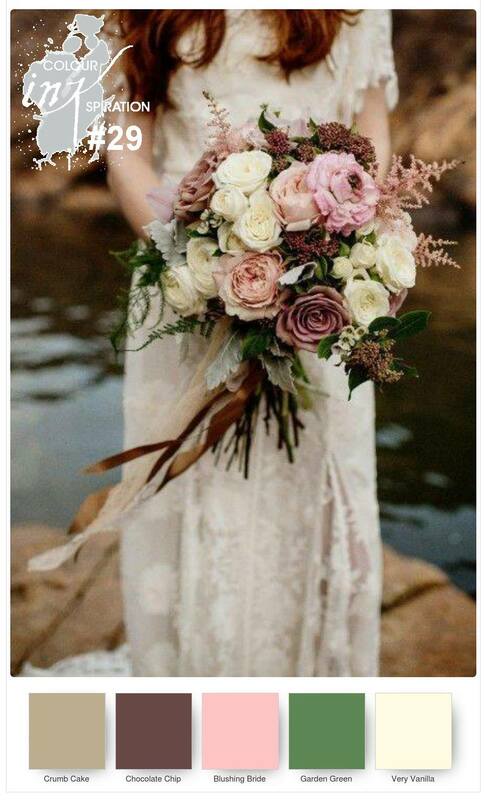 This photo conjures up vingtage lace & pretty flowers for me, however I just didnt have the mojo to actually create those things! I have to admit, my cards are quite simple today but I am proud I actually made something. Here are my two cards similar in design yet different in essence. 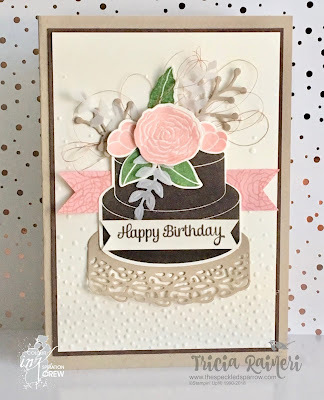 For my first card I have clear embossed the cake from Cake Soiree in Chocolate Chip. I used the Garden Green & Blushing Bride markers to colour the flowers & embossed the back ground using the Sequins embossing folder. I also sprinked some wink of stella over the sequins & flowers for extra shine, but it's not easy to see here. 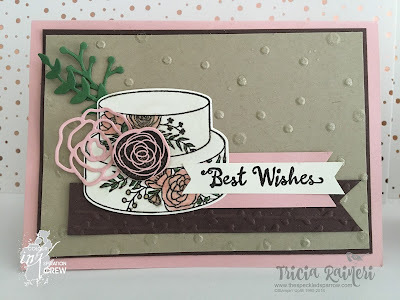 My second card uses the lovely new Springtime Foils DSP from the new Sale-A-Bration offerings. It is such a lovely DSP & colours well. I used the markers once again on this flower & cut it out. The background is embossed using the Petal Pair embossing folder. I've added some Garden Green ribbon & the sentiment is from A Good Day stamp set from the Occasions Catalogue. I really wasnt that happy with these cards, they were just not what I had pictured making, so I made another one. This one was more what I had in my head. I wanted a chocoltate cake as soon as I used the Chocolate Chip ink so I knew I had to have one more try. Thanks for visitng today. 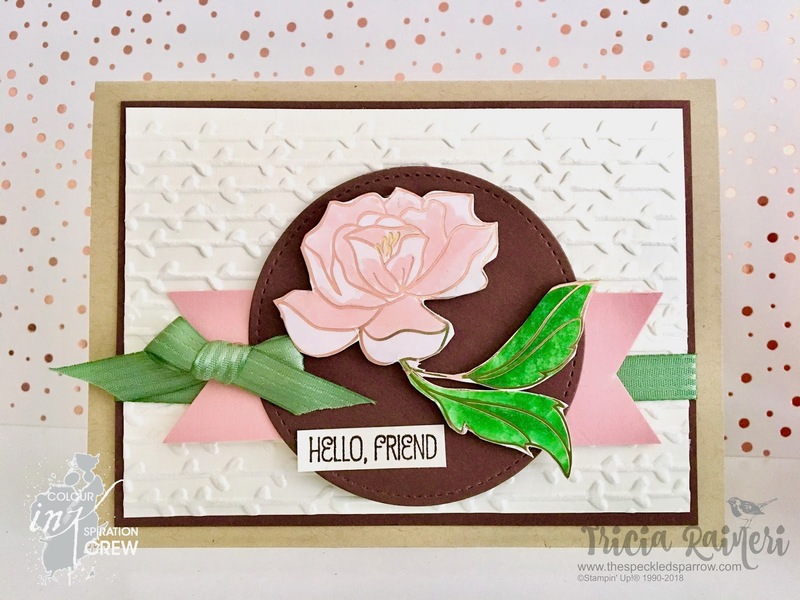 To continue the hop just click onto the next blog to see what Mel has created for you - Oh my goodness it is simply adorable!